Wanna to win in the battlefield of Innovation? Come to have a set of Sand Table Confrontation! The release of this Japanese version is to provide more user-friendly using experience for Japanese clients. Japanese version supports interface displayed in Japanese which will bring better experience for Japanese speaking users. 3D Patent Sand Table is an advanced tool for patent strategic analysis. Using 3D Patent Sand Table to do simulation deduction, users could quickly focus on the hot spots of patent layout and grasp the R&D directions and patent portfolios of competitors to improve the patent quality and market competitive power. Graph Search has been officially released. Use global picture to match images based on contents to help users to find out the most similar design patents compared with the target picture. The process is completely auto with no human intervention or assistant. incoPat provides titles and abstracts of global patents in both English and Chinese. For some major countries like China, USA, Russia, Germany and French, patents’ full-text are provided in Chinese and English. There is no more Language Barriers in accessing global intelligence. incoPat collects more than 100 million pieces of patent information from 117 authorities. All data are collected from official patent offices of difference countries and business vendors. Patent data is updated four times every week which speed holds a lead all around to helps grasp the latest technology at the first time. Through fully combination and processing of data, incoPat provides as many as 240 searching fields, making an integration of data like patent litigation, assignment, licensing, reexamination-invalidation, communication standards and custom record and also deep processing of patent family and citation information to give you a clearer competitive view. The system supports shifting between original database and patent family database. While searching in patent family database, with the complementary information among titles, abstracts, patentees of different family members, the searching results can be more comprehensive; While browsing patents in patent family database, with same inventions merged into one folder, reading can be clearer; While doing statistics and analysis in patent family database, the results can be more scientific because one patent family is analyzed only once. incoPat supports more than 70 dimensions of self-defined statistical analysis, providing various visible templates including line chart, bar chart, pie chart, column chart, global map, Chinese map, bubble chart, stacked bar chart, radar map and so on. Also the system could generate report automatically for you to get easy access to analysis conclusion of patent data. By inputting a passage of technology information, the system will help find out the most similar patent technologies. Incopat used big data and AI to set up a patent DNA analyzing technology. Each patent will be detected, and there will be feature extraction for patents from article level, section level, word level and semantic level and then use deep learning technology to do high latitude feature extraction and apply it into semantic search. n the process of innovation, enterprises need to seek the inspiration for invention and doing research on the basis of global top inventions. Using incopat to search top intelligence around world could help enterprise to avoid repeated R&D and to raise the starting point of R&D and the innovation efficiency. Enterprises could use incoPat to grasp the R&D direction and patent portfolio of competitors, obtain efficient competition intelligence to support making scientific R&D decisions. With the constantly improvement of patent protection system in China, the huge Chinese market is becoming a big magnet for foreign enterprises. Enterprises out of China need to mitigate risks for patent infringement and also need to obtain patent rights in China to win the market. 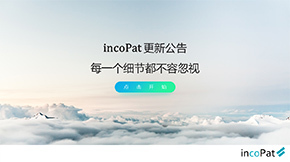 Foreign enterprises could use incoPat to master the patent and technology information in China and obtain alerts for patent infringement risks to convoy the developing of Chinese market. Independent and comprehensive data updated timely; each piece of data is strictly tested. Support EN/CN to search global patents with quite user-friendly interface. Support the export of a large volume of data statisitic analysis and more professional search portals. Provides timely, stable and one to one service. All data are saved on private owned server with tight guarding procedure to ensure information safety. As an industry-leading enterprise, QIHOO attaches great importance to the application of patent information. Through the cooperation with INCOPAT, we can fully feel the professional and diligent manner of their team. Wish we two company, INCOPAT and QIHUOO, make a mutual development and cooperation in the future to realize the Chinese Patent Dream of the whole internet. The interface of incoPat is user-friendly with patent abstracts in Chinese together with the original text and core drawings, which helps increasing efficiency in preliminary novelty search. Further more, the pricing is reasonable and good-value. incoPat collects patent information from different dimensions, through which we can search from the dimension of technology, law and others. This gives us strong basis for making decision. incoPat is simple to use and fits users demands closely; the service is also pretty satisfying. incoPat has powerful searching and analysis function with user-friendly interface. It is quick to learn and supports Chinese-English searching with diversified searching modes. It also supports exporting bibliographic data and PDF in batches. The after-sale service of incoPat is nice with always quick response to clients’ voice which is well received by the industry.